The Tararua Forest Park, north of Wellington, can be accessed from both the Wairairapa and the Kapiti Coast. The park has almost 50 backcountry huts, and the best? Blue Range Hut of course. And why do I think this? I have visited almost all the huts in the park: some are harder to get to; some have better views; some are bigger; and some are smaller. However, what sets Blue Range Hut apart from the rest is its unique character. Blue Range hut is approximately a 3 hour walk from the Kiriwhakapapa road end, north of Masterton. This makes it a perfect day trip or an easy overnighter. There is also a fabulous DOC campground at the road end with a large cooking shelter, flushing toilets and short walks (drinking water from a nearby stream). It is a steep climb up to the hut, however the magnificent podocarp bush will more than make up for it and, if you’re very lucky you might see/hear visiting kaka from nearby Pukaha Mount Bruce. At the top of the hill there is a large, appropriately placed rock to enjoy the view of the main range, including the impressive and steep sided Dundas Peak, and the highest peak in the park—Mitre (1571 metres). From here it’s a easy 20 minute walk down the hill to the hut. It’s hard to miss the hut as it’s painted bright blue and has a “tow away area after 2 pm” sign! And that is part of the reason I love Blue Range Hut. It has numerous signs both inside and outside the hut that have come from the old Masterton hospital. A visitor (or patient?) could be confused on arrival as on the door of the hut is a sign saying “Do not enter while surgery is in progress”. Once inside the hut (after surgery has finished! ), you will find signs on the four bunks that are for “patients only”. 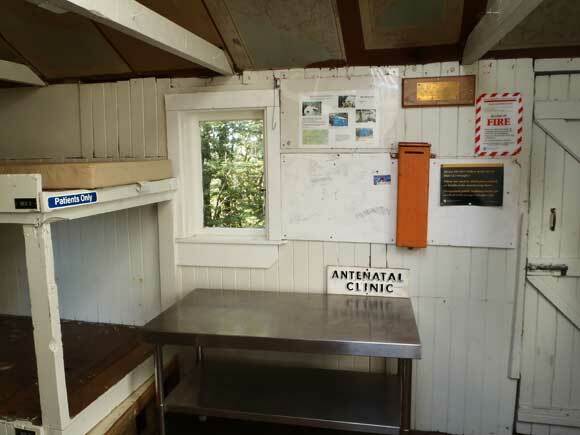 Blue Range Hut is also apparently the “antenatal clinic”. Such a versatile little hut! For this reason Blue Range Hut is easily my favourite hut in the park, and a place I enjoying visiting often. Why don’t you come up yourself and check out these signs and the wonder bush and views for yourself, you won’t be disappointed. 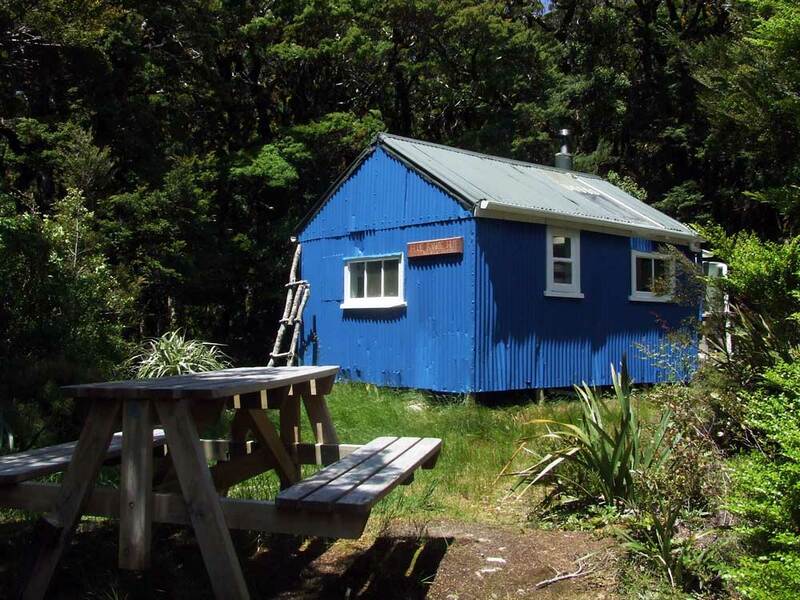 Blue Range Hut was the destination for my first ever tramp with Tongue and Meats (Wgtn Tramping and Mountaineering Club) in 1981 when I was a young fella. We camped under tent flies at the road end on Friday night in mid winter, with snow on the ground. Awesome. I still have very fond memories of the old hut – despite its smokey chimney, and it kicked off many years of exploring in the ranges with the club. Nice to see it’s still standing and providing shelter to thousands more trampers.